I’m so excited to be sharing a fun new series with you today! 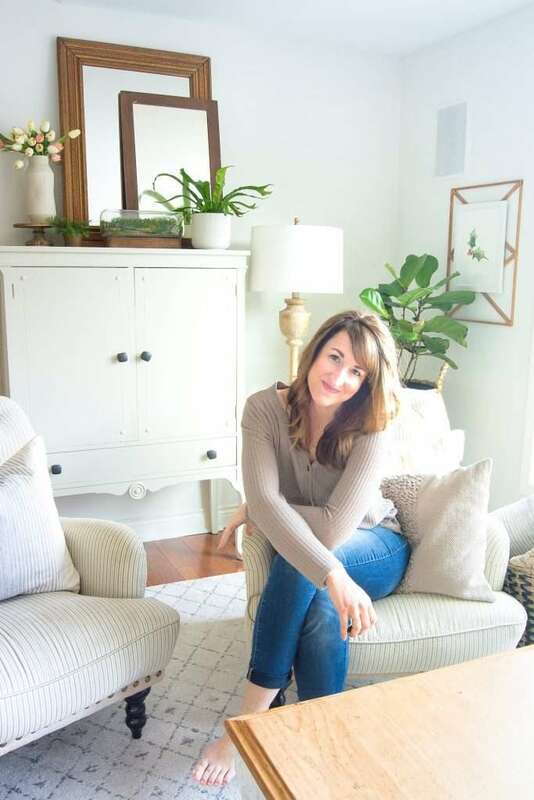 So often I’m asked how to take a space from dream to reality, and over the next three weeks I’ll be showing you how to do exactly that with a complete guide to creating spaces you love. 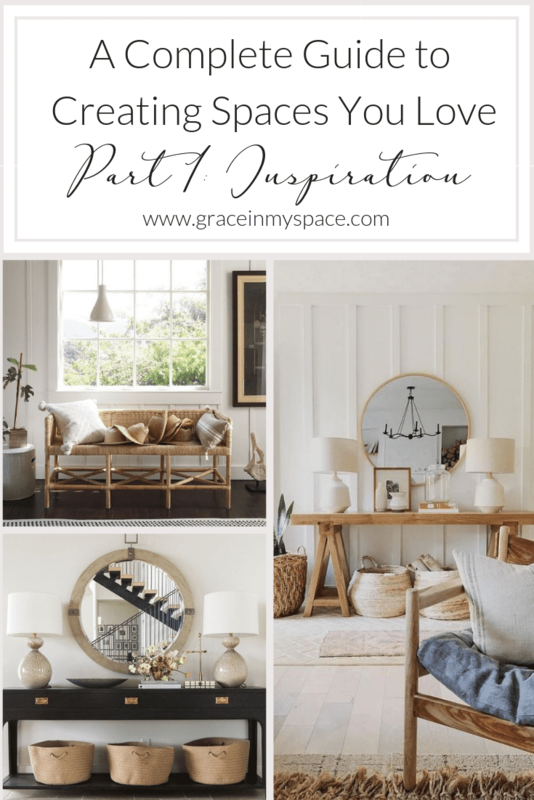 Today is part 1 and we’re talking about interior design inspiration! Joining me are some amazingly talented bloggers each sharing their own advice on this topic. Make sure to check out their posts each week, which will be linked at the bottom of each post. 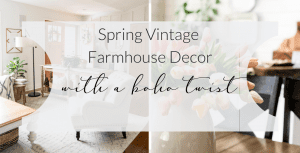 If you’ve followed me for any length of time here on the blog or on Instagram, then you know that I am a HUGE advocate for elevating your home to haven status. I wrote a book on this very topic, taking you through all 10 steps of my process because I am so passionate about seeing others love their homes. So I was so excited to be asked to participate in this blogger collaboration to get to share my mindset towards creating spaces. We will each be breaking this series down into three parts: inspiration, realization and implementation. So, with that in mind, let’s get started! 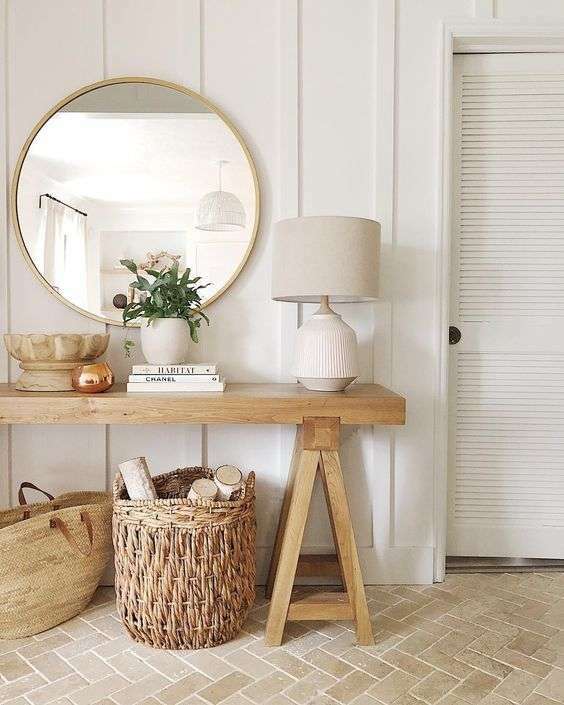 Often when I talk about interior design inspiration I get blank stares and the question, “But how do you even know where to start?” In my personal opinion, the starting place is the most fun! The first step I take in creating a space I love is to seek interior design inspiration from others. This can be in the form of magazines, Instagram, design books, or my personal favorite, Pinterest. 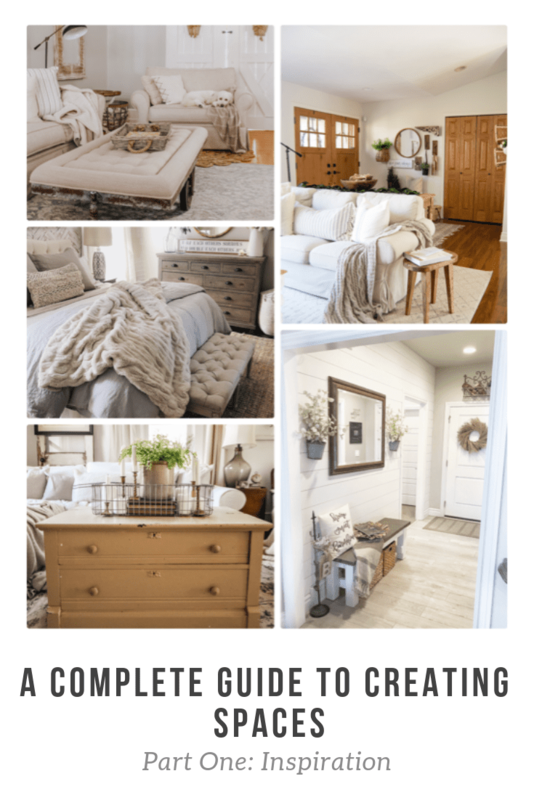 In order to showcase exactly how I accomplish this first step, I want to walk you through a project in my own home from start to finish. When we moved to our current home I decided to create a gallery wall in my entryway showcasing some of my favorite pieces of decor. You can see how the entryway looks currently below. Now that we’ve lived in our home almost a year, I am ready to change this space into something that fits my current design style. Notice that I say, “current design style”. That’s because it is ever changing! One of the elements of my book I talk about is allowing fluidity in our haven making process. Design isn’t meant to be stagnant, unless you personally still love it! 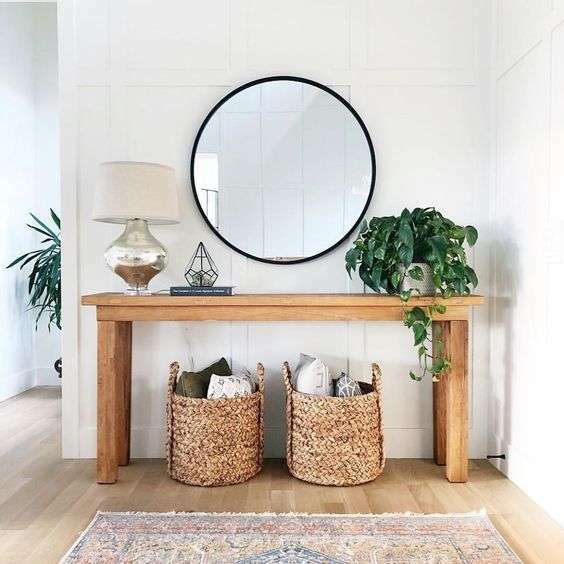 So as I thought about what interior design inspiration has been impacting me lately, I went to my Pinterest boards on Entryways. Below, I want to break down how I analyze my inspiration photos to determine how to proceed with next steps. To say that Pinterest can be overwhelming is an understatement. For that reason, I like to save a small amount of photos to my “dream boards” that make me stop and stare at them. 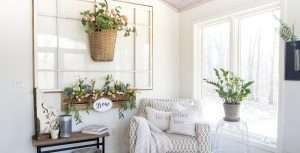 Pretty photos are a dime a dozen, but inspirational photos should speak to you in a way that makes you feel like you could actually accomplish a similar look in your home. Let’s take the below photos as an example. 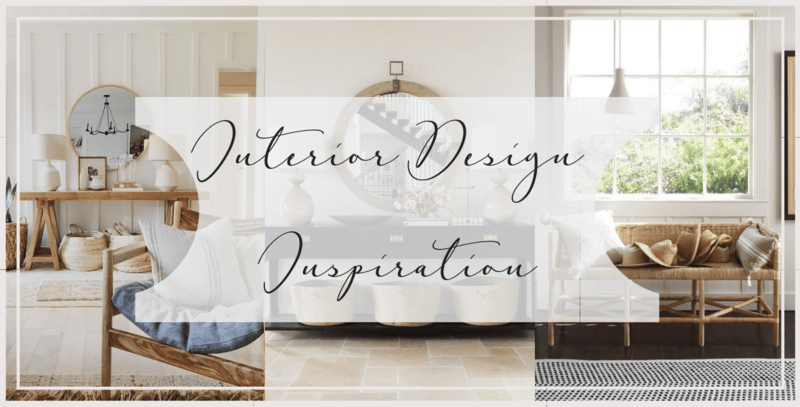 I’ll show you how I dissect interior design inspiration photos to see what I truly love about them! This image from House Seven Design has been seared into my mind since the moment I saw it. I love every single detail. However, I love it in Anissa’s home specifically because it flows with her style. In my home, it would be out of place to try to duplicate this space. The point of inspiration photos is not to copy them. Rather, it is to analyze the exact details that inspire you and then pull those details into your own design. 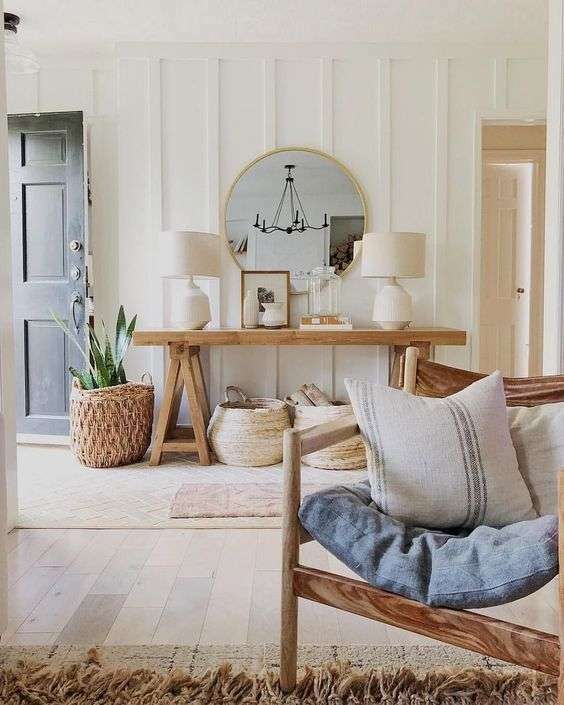 I chose to show you this image by Lindsay Hill Interiors next because of its similarities to the first design inspiration. Notice the design elements that are repeating? Board and batten detail, wood tones, baskets. All things I adore! But this one adds another element that I love: plants. For my third inspiration photo I want to talk about how to decipher what you actually love about a photo. The first thing that drew my eye to this photo was the high contrast of light and dark. However, when I study it further I realize that it is actually the symmetry of the space that I love. The table is striking, but if it were light I would still love the design elements because of the way they balanced the decor. 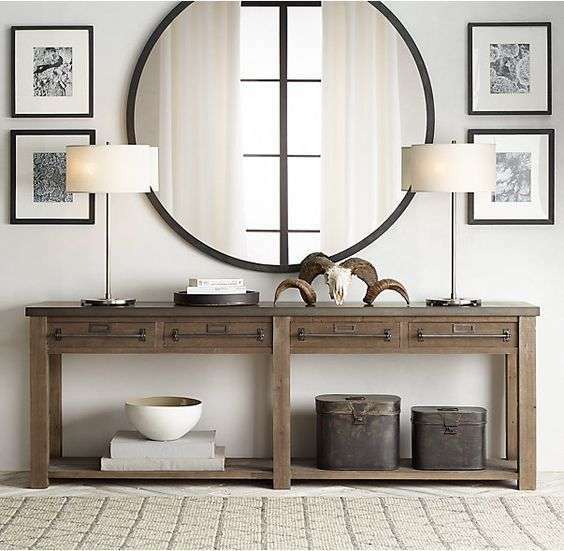 Similarly to the above photo, the balance of decor in this photo by Restoration Hardware makes me stop and stare! They use interesting decor that would be a conversation starter. 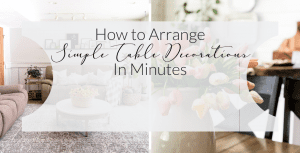 The table could easily be swapped out for something different and it would still be a beautiful, well balanced, space! Every other detail is peripheral! 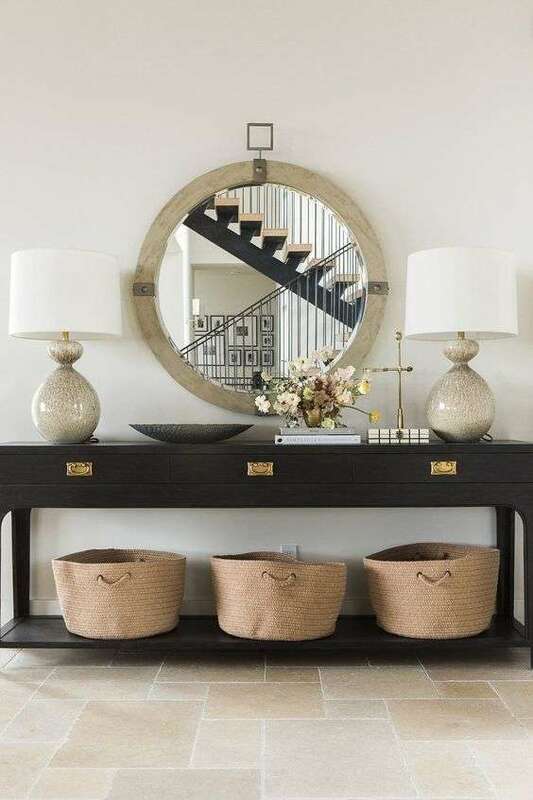 I can swap out the decor for pieces that fit my style better and my new entryway will still be something I’m inspired by. The goal is to create a space that moves you towards the ultimate goal of creating a haven. I break down some of the first steps in this process further in my book, Designing a Life: From House to Haven. Until next week, make sure to head to the links below to learn more about the design process my fellow bloggers use! There are no hard and fast rules to design so be open to seeing which technique works best for you! Sarah, This is so amazing! I absolutely love how you walked through this process, because you put into words exactly what I do too on Pinterest. It makes it so easy to understand and I am grateful for you sharing it all! Thank you so much for being on this amazing guide series with me, truly honored! Thank you Brendt! I loved your post as well! It is awesome to see different approaches to this topic! I love how you chose a few inspiring photos and then transferred that to your home and style. I could quickly see the inspiration. 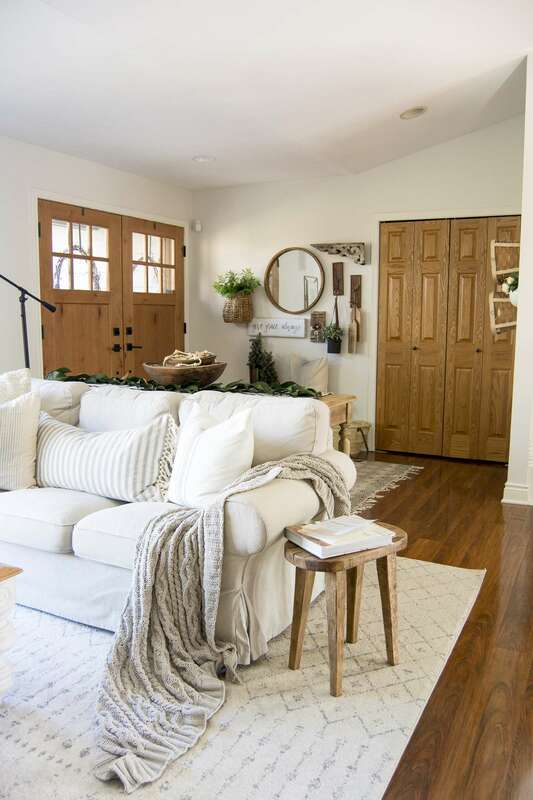 I love these ideas and want to use them going forward in my home design choices. So fun doing this with you, XO! Thank you Lindsay! I love the inspiration stage! So many possibilities! I love seeing all the different photos that you used for your inspiration! Makes me want to do the same thing! Great job girl. Sarah this article is awesome and so informative! Oh my heavens I love how you broke this down!! Seriously it made so much sense in my mind – I can’t wait to try all your tips! I’m so glad it was helpful! I loved your tips as well my friend!